Bigravity: A Hidden 'Gear' for Gravity? Physicists come up with alternate explanation of gravity that may implicate dark energy, which comprises 70 percent of our universe. An artist's conception of our universe, where gravity (the green grid) is trying to keep everything together and a mysterious dark energy (the purple grid) is trying to tear everything apart. (Inside Science) -- Two physicists from Montana State University in Bozeman propose a way to test an existing theory of gravity where a hidden "gear" may explain the mystery of dark energy -- an unknown substance that makes up 70 percent of our universe. The paper, published in Classical and Quantum Gravity, suggests that astronomers may be able to test models of bigravity -- a theory in which there are two different components of gravity, as suggested by its prefix -- using X-ray, radio and gravitational wave measurements of neutron stars. Scientists have known since at least the 1990s that our universe is expanding at an accelerating rate. But this doesn't make sense, because gravity -- an attractive force like a rubber band -- is supposed to cause our universe to contract or at least slow down the expansion. "It's like if you took a ball and threw it up in the air, but instead of falling back down, it just kept going up faster and faster," said Andrew Sullivan, a physicist from Montana State University and author of the paper. Scientists theorized that some other force must be responsible for ripping the universe apart, and "dark energy" became the placeholder term for the mysterious force. One way to solve the dark energy riddle is to modify the theory of gravity itself, such that gravity can actually begin to repel over extremely long distances. In other words, the same gravity that is keeping us from falling off the face of the Earth could be ripping apart our universe at the same time. As early as the 1930s, long before scientists knew about the expansion rate of our universe, Swiss physicists Wolfgang Pauli and Markus Fierz had already speculated that gravity may have a bipolar personality. However, their theory at the time was haunted by what's known as "ghost modes," which are parts of a theory that produce nonsensical solutions. "If a theory has a ghost mode, it's typically dead in the water," said Sullivan. In 2009, physicists Claudia de Rham, Gregory Gabadadze and Andrew Tolley together found a "ghost-free" solution to the bigravity theory, revitalizing the theory as a possible answer to dark energy. But just because the theory is no longer nonsensical doesn't mean that it is correct. It still needs to stand the test of the scientific method. "One of the biggest challenges these theories face is that they are by default very difficult to observe," said Johannes Noller, a physicist from the University of Oxford in England who is not involved in the study. If gravity indeed acts differently over an extremely long distance -- much larger than even our galaxy -- and its effect is too small to observe over the distance of our solar system, then how can scientists test their theories? In 2015, scientists were able to directly measure gravitational waves for the first time in history thanks to the unprecedented sensitivity of the LIGO and Virgo detectors. Before the breakthrough, astronomers were basically limited to observing the universe via light. With the advent of gravitational wave detectors, scientists now can observe our universe a different way: by measuring the ripples through the fabric of space-time itself. "With all these new gravitational wave observations, we now have new ways to test and constrain these theories of gravity," said Noller. 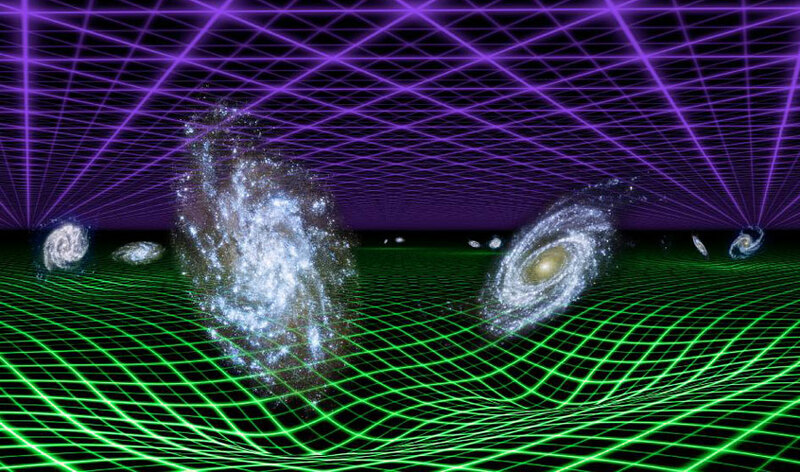 If bigravity is real and gravity does change with distance in a way that defies Einstein's theory of general relativity, then the mass of something would depend on its distance from the observer. According to the paper, observations of super heavy objects such as two neutron stars orbiting around each other will allow scientists to compare the stars' mass as measured here on Earth with how each star's mass affects the other's behavior. If bigravity is real, physicists in the future can use more and more sensitive gravitational wave detectors and telescopes to put a limit on the possible effect of this hidden "gear" of gravity and its significance in solving the mystery of dark energy. How Much Starlight Has the Universe Produced?